Did you know that "eating clean" can taste like the best thing ever? And look like this? I created this stuffed avocado meal with the 4-week challenge in mind, but let's be real -- I could eat this every day, challenge or not. I LOVE avocados. Most of us do, right? They're a gift from nature! Scooping a bit of one out and combining it with some other delicious ingredients like chicken, tomato, spinach, greek yogurt, and spices just makes sense. It's easy too! Cut a large, ripe avocado in half and remove the pit. Scoop out the flesh, leaving about a half inch of avocado still there. 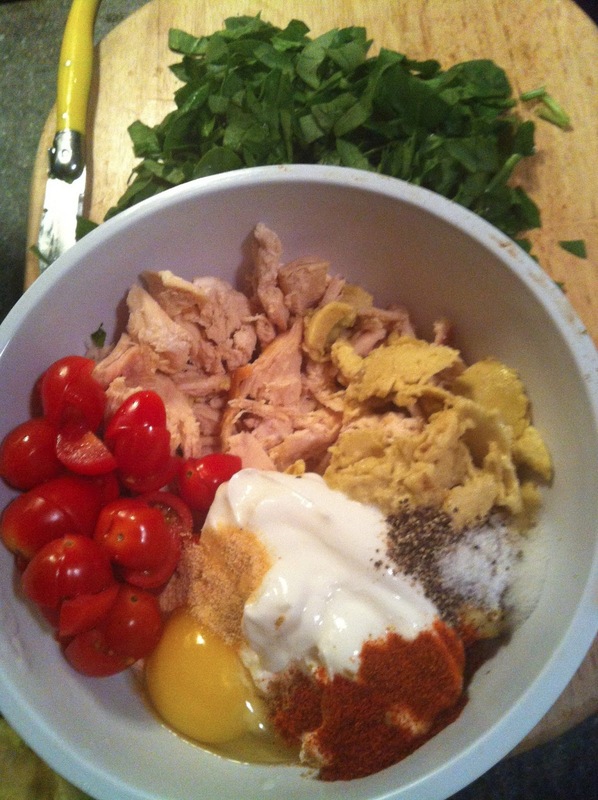 Add what you scoop out to a bowl with about 2 cups of shredded, cooked white meat chicken. I used the breast meat from a store-bought rotisserie chicken. If needed, find a simple method for shredded chicken here. Then, add the rest of your filling ingredients to the bowl: 1 egg, 1/4 cup greek yogurt, 10-12 grape quartered grape tomatoes, 1 cup finely chopped spinach, and spices (garlic powder, chili powder, cayenne, salt, and pepper). 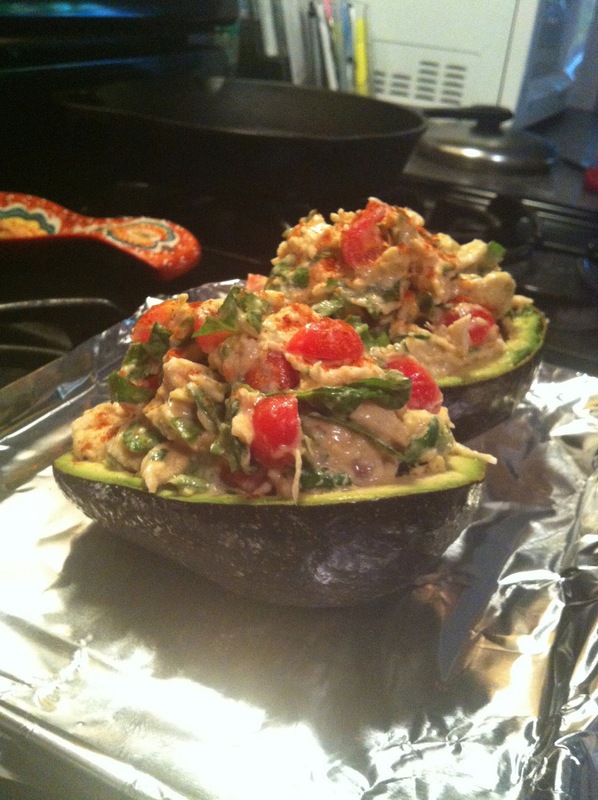 Scoop as much of the mixture as you can fit into each avocado half and place on a foil-lined baking sheet. Sprinkle on a bit of extra chile powder for color and flavor. (Side note: you'll probably have some leftover chicken mixture... I just baked the remaining mixture in a ramekin and had it plain the next day for lunch. You could also have the leftover in a wheat wrap). Bake at 375 degrees for 10-12 minutes, or until warm. Meanwhile, make your sauce. Combine 2 tbsp greek yogurt with a tablespoon of sriracha. Add in about a tablespoon of almond milk (or coconut milk or regular milk), or until desired consistency is reached. Pull those delicious babies out of the oven. Drizzle the sauce overtop and enjoy! -Cut the avocado in half, carefully removing the pit. 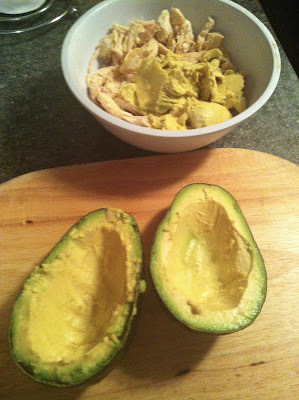 Scoop out the middle of each avocado half, leaving about 1/2 an inch of avocado in the skin. Add the scooped out avocado to a large bowl. -To the bowl with the avocado, add the chicken, spinach, tomatoes, 1/4 cup greek yogurt, egg, and spices. Mix very well until all combined. -Scoop as much mixture as you can fit onto each avocado half. Sprinkle with extra chile powder if desired. 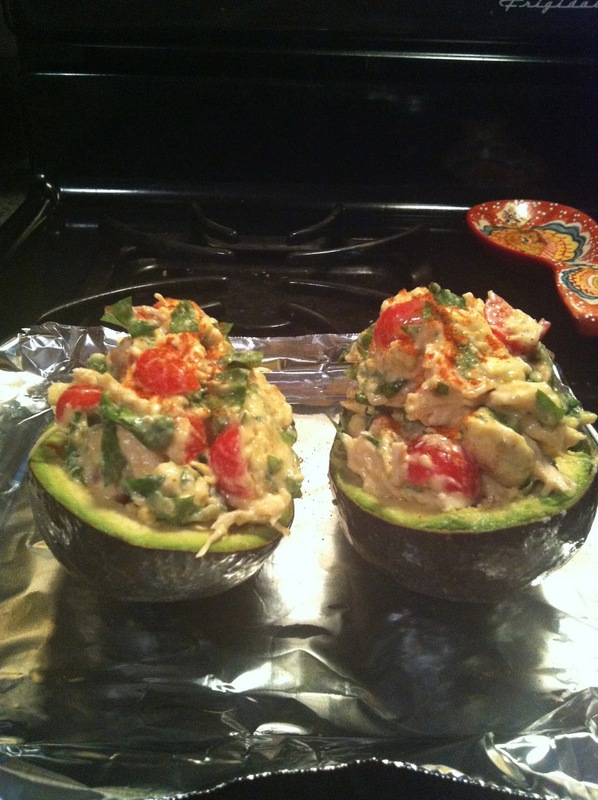 -Place stuffed avocados on a foil-lined baking sheet and bake for 10-12 minutes, or until warm. 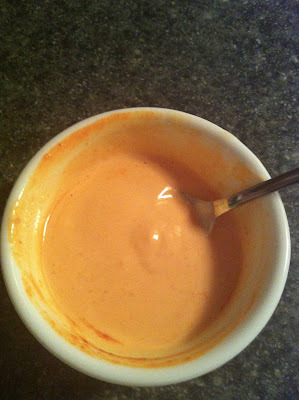 -Meanwhile, prepare sauce: whisk together 2 tbsp of greek yogurt with 1 tbsp sriracha. Whisk in about 1 tbsp of almond milk, or until desired consistency is reached. -When avocados are done, drizzle with sriracha-yogurt sauce and serve immediately. Holy cow these were good! We made them last night for dinner and the hubs says it is one of his favorite things I have ever made! Thanks for the recipe! 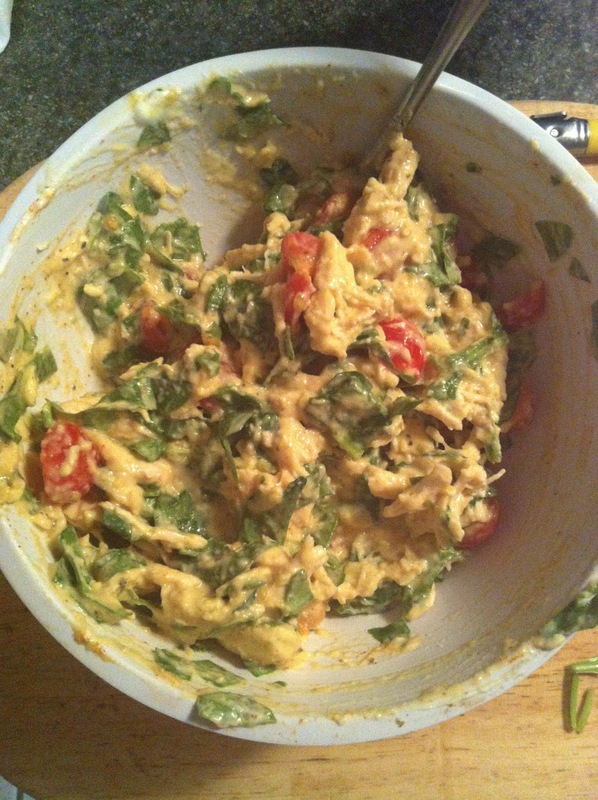 I hope you don't mind, but I shared your recipe and blog on my blog! I made this over the weekend. Followed the recipe to a T! It was obvi amazing. We made 5 avocados so 10 halves and ate half for dinner with a caprese salad and the other half for lunch the next day - cold - just scraping it out with crackers! It was delicious both ways. I cannot believe I just now tried this recipe! I made this and served it with your rosemary red potatoes and garlic sauce- what a great meal! I made these tonight and oh my! beyond good. I forgot the egg and didn't miss it at all actually. Thank you so much. Alright- i never comment on recipes- let alone make it exactly the way it states. But I made these tonigh (without the yogurt) but still they were DELICIOUS! !